Featuring 26 classic pinball machines as well as a selection of classic video arcade multi-game cabinets, The Ottawa Pinball Arcade boasts the largest number of classic pinball machines available for the public to play anywhere in Canada. Conveniently located inside The Neighbourhood Pub, the Ottawa Pinball Arcade offers hours of entertainment for the whole family and fantastic food and drink options, including what are arguably the best wings in Ottawa. This collection of games represents a true window to the past, and will instantly bring back a flood of nostalgic memories to anyone who grew up in the Golden Era of the Arcade. Mike has been an avid pinball fan since he was a young boy, and the Ottawa Pinball Arcade is the expression of his life long dream to operate the fantasy pinball arcade of his youth. He has selected the pinball machines based on his favourite memories of the many Ottawa arcades and locations from a time when pinball was as much a part of our culture as social media and cell phones are now. 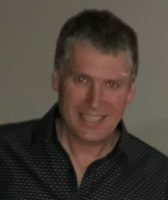 Constantly on the lookout for his old favourites, he is continually striving to improve and rotate the selection of games to share them with the public and fellow lovers of Canadian Pinball Culture. AJ has been in the food and beverage industry for his entire career. As the owner and manager of the Neighbourhood Pub, he not only hosts the Ottawa Pinball Arcade, but is behind the great beer selection, representing both favorite commercial and local micro breweries, as well as the family friendly food offerings, including their amazing chicken wings.